RightCapital exists for financial planning, done just right. RightCapital is perfectly tuned for tailor-made advising. The first step in breaking out of the box and letting your unique approach to advising shine is by setting global options which will apply to all new clients. Preset values for key settings and variables that will apply to all new clients created within RightCapital. Navigate to Advisor Portal > ⛭ > Account > Client Presets. Looking to change settings for just one client? To change settings on a client-by-client basis, read the article on client settings. This article identifies how to make changes which affect all clients. If a glide path is enabled, the client's investment allocation will slowly migrate to the glide path allocation over the specified number of years. See additional details about glide paths. The Target Allocation is the asset allocation model that can be compared to the client's current allocation on Client Portal > Investment > Asset Allocation. Create custom asset allocation models or use the default models included with the software. Default setting is your residence state. The residence state determines the state used for calculating state income tax. This will automatically update on a per-client basis if a state is indicated when adding the family to RightCapital. To update the residence state after a client has been added, navigate to Client Portal > Profile > Family and clicking on the Client card. Default setting is Modified cash flow based. The planning method indicates how RightCapital handles surplus/shortage of cash flow in any given year. To learn more about planning methods and the impact on a client plan, read our article on understanding planning methods as well as our article on cash flows. Default setting is RMD added to manual distribution. 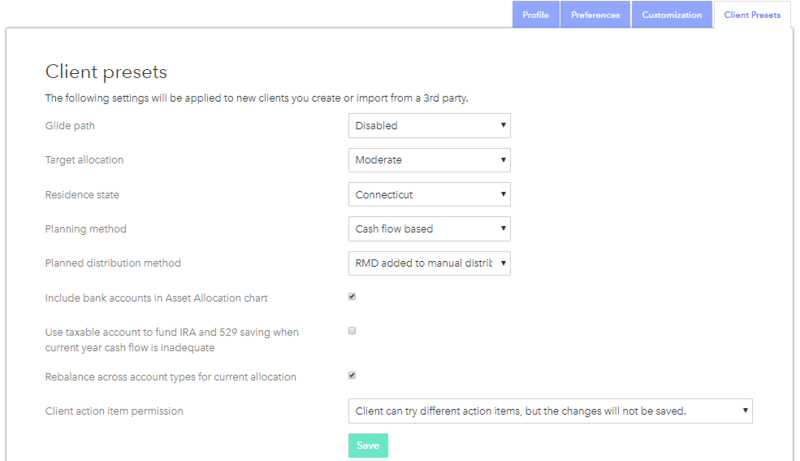 The default option combines any distributions inputted with the calculated RMD amount, for one distribution value (the sum of RMD and other distributions). Greater of RMD and manual distribution means that only one distribution will be used: either the distribution inputted, or the RMD amount, whichever is greater. No RMD, manual distribution only ignores the RMD and only uses distributions inputted. This setting includes cash held in bank accounts to the asset allocation mix (typically displaying an overall higher percentage of assets held in cash). Bank account values are added to Investment values for a combined allocation chart on Client Portal > Investment > Asset Allocation. This setting will automatically calculate a withdraw (and taxes) from a taxable investment account to maintain savings goals in non-taxable accounts in years when other income sources are unable to meet the specified savings goal. This setting will automatically calculate a shift in assets from their current values to such values that will align with the current investment allocation breakdown. This setting controls how clients interact with the action items on sections like the Retirement Analysis screen. Learn more about setting client access permissions. To set individual settings on a per-client basis, review information on the planning method and other plan settings here.